As far back as I can remember, I heard stories about my father’s family in Independence, MO. We were told that the painting we had above our couch for years was of a relative whose friend had accidentally shot him to death during the night as they slept in a room above a bank in the 1800’s. My sister and I were given an article about our ancestors when we were teenagers (written in the 1960’s), telling, among other things, about an uncle who was the first mayor of Independence, and about being locked in the bank’s vault during a bank robbery. The robbers were even suspected to be Jesse James and his gang. It wasn’t until I was in my early 50’s, and had my first grandchild, that my interest in Independence really took hold, and turned into an all out obsession. I published my first short story, and I decided I wanted to put together a collection of stories written by family members or about family members so they could be enjoyed by generations to come. I found stories I had written in school, stories my daughter had written in school, letters from my father while in the Navy, and the article about our family in Independence. In the article, it mentioned that my great great grandfather, John McCoy, had some stories published in the newspaper in Kansas City about his travels around the west in the 1800’s. These stories seemed quite interesting to me, so I contacted the Jackson County, MO, Historical Society via email to see if they knew where I could get copies of these stories, since the historical society had published the article about my family members. They answered me and suggested I see if I could get them by making an inter-library request, which I did, and never received the stories. 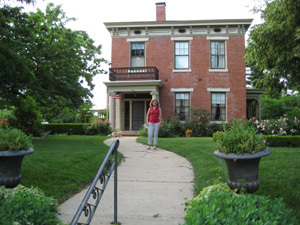 In the email from the historical society, they mentioned a lady named Sharon Snyder who was currently living in the original William McCoy house, and they said I had her permission to contact her via email. William McCoy was John McCoy’s brother, who was the first mayor of Independence, among other things. Some time passed, I contacted Sharon, and thus began a wonderful friendship and a source of more information and stories about my family then I could’ve ever imagined. She sent me a book on the McCoy neighborhood, old photos, articles about the accomplishments of the McCoys, including stories written by John, and information tracing my ancestors to the 1700’s when they came to the U.S. from Scotland. I eagerly put everything together into a scrapbook, thinking that would be the extent of my project, until I received another book from Sharon that changed everything. Shortly before Christmas 2009, Sharon sent me a book titled, “Deaths on Pleasant Street,” by Giles Fowler. She said it was about a famous murder that took place in Independence in 1909, and that William and John McCoy’s granddaughters were friends of the victim’s family, and were mentioned in the book, so she thought I might enjoy it. I love a good murder mystery, especially a true story, so I began reading it shortly after I received it. To my surprise, I found that I was also directly related to the murder victims. The story is about the murders of several members of the prominent Independence and Kansas City, MO, family, the Swopes, including the very wealthy Thomas Swope, who gave huge Swope Park to the people of Kansas City. Thomas Swope’s brother, Logan, was married to Maggie Chrisman, who was the aunt of my great grandmother, Lucy Chrisman McCoy. Logan Swope was deceased, and Thomas Swope was living in the mansion in Independence with Maggie and her children, (my cousins, Lucy’s first cousins.) Thomas Swope, his cousin Moss Hunton, and Maggie’s son Chrisman Swope were all suspected to be murdered by Maggie’s daughter’s husband, Dr. Hyde. I could not believe I had never heard this story before. It was huge at the time, being in the New York Times and Chicago newspapers. My father was deceased, so I called my mother to ask her about it. She hadn’t heard the story either, but had an old envelope with McCoy things in it that she said I could look through. The envelope contained letters written by John McCoy and his son, Stewart, who was shot in the room above the bank, and some old tin photos. I transcribed the letters, and sent the originals and some photos to the Jackson County Historical Society, and continued writing Sharon. She mentioned how fun it would be to show me her house and other historical places in Independence. I was interested in seeing everything, but thought the trip would be pretty much impossible because of how far Independence was from Batavia, Ohio, among other things. Things changed, however, in the early part of 2010 when I was laid off from my job, making it easier for me to plan a spontaneous trip, also, my step father drove through Independence on his way to Kansas, and said the drive was only about 10 hours, and I found out the Jackson County Historical Society was having a re-enactment of the Swope murder trial in Independence on June 12, 2010, to celebrate the 100 year anniversary of the trial. There were no excuses not to go now. My husband requested the time off from work, I purchased tickets to the performance, and reserved room at a local bed and breakfast, and we were on our way. 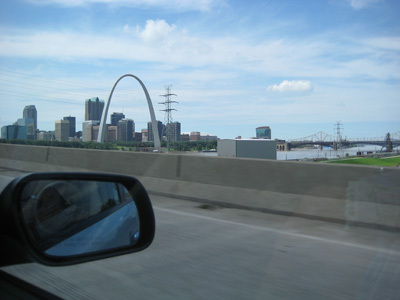 We hit the road early, barreling into Kentucky, then Indiana, Illinois, and finally Missouri. It seemed like the drive lasted forever because the land was flat with nothing but farmland as far as the eye could see. I thought often about the millions of travelers who took this route in the past, from early settlers in covered wagons and on horseback to the poor folks depicted in “The Grapes of Wrath.” I felt the lawlessness of the area too that bred men like Jesse James. As we approached St. Louis, MO, we actually missed the turn off to by-pass the city, so we drove straight through and got a nice look at the famous arch. When we approached Independence, we noticed another modern landmark that was visible for miles. It was the unusually shaped steeple at the Mormon temple in Independence. 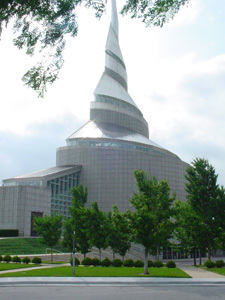 Apparently, Mormon founder John Smith had a revelation that Independence, MO, was sacred ground and had a temple built there. There is now a large Mormon following in Independence, and this modern steeple towers above the town and is visible from miles away. Our hotel was also a Mormon run bed and breakfast. It was called “The Higher Ground Bed and Breakfast,” and was relatively modern for the area. The furnishings were antiques, which I liked because they made me feel like I was going back in time. Breakfast was very limited, the room was hot at night because they turned off the air conditioning for some reason, and, strangely, the birds were very loud, waking us up at 3:00 a.m. with their loud chirping. After we checked into the hotel, we found a nice place to eat near the square, which is the center of Independence. 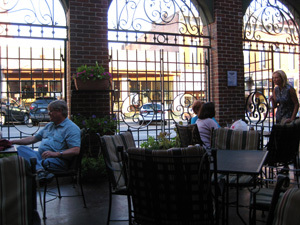 We ate at Verona’s, outside beside a fountain. It was wonderful after our long drive. After a restless night, we were thrilled to be picked up in the morning by Sharon Snyder and her friend Jenell Yoka for a personal tour. 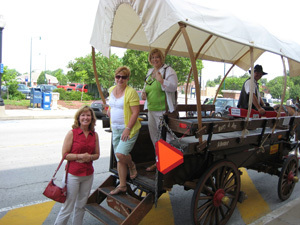 We started the day with an informative and entertaining covered-wagon ride around the center of town, pulled by real Missouri Mules. The driver told us about the rich history of Independence, where fighting between members of north and south started long before the Civil War. It was also a very busy town, having some of the main covered-wagon trails going through it and it was an important delivery junction on the Missouri River. “Independence was selected as a place of arrival and departure as well as an outfitting place for trappers and hunters of the mountains and Western plains. It was well worthwhile to witness the arrival of some of the pack-trains. Before entering they gave notice of their arrival by the shooting of guns, so that when they reached the Owens and Aull store a goodly number of people were there to welcome them. A greasy, dirty set of men they were. Water, surely was a rare commodity with them. They little cared for it except to slack their thirst. Their animals were loaded down with heavy packs of buffalo robes and peltry. Occasionally they had a small wagon, which, after long usage, had the fellies and spokes wrapped with rawhide to keep the vehicle from falling to pieces. So accustomed were they to their work that it took them little time to unload the burdens from the backs of the animals and store their goods in the warehouse. The trappers let the merchants attend to the shipping. The arrival at Independence was always a joyous ending of a hazardous trip, and when once safely over it, they were always ready for a jolly time, which they had to their hearts’ content. They made the welkin ring and filled the town with high carnival for many days. Next we were given a tour of the old town jail. 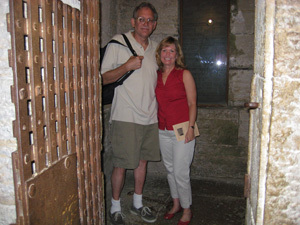 It was built in 1859, with the cells constructed out of native limestone. The bricked portion of the building was the Marshall’s residence, where the family lived with open parts where the children could see right into the jail. The most famous occupant was Jesse’s brother, Frank James, who was treated nicely, and may even have had his meals with the Marshall’s family. Then it was on to see the McCoy graves in the nearby graveyard. They were all there too, John and William, their wives, children, grandchildren. I imagined them all in the fashions of the times as they stood together mourning their losses. Many of the headstones had been replaced with modern ones, so I was pleased to find the original headstone of poor Robert Stewart McCoy, who died at age 23 in the accidental shooting. Following are photos of R. Stewart McCoy, first on rear left, and his surveying team. After the graveyard, we drove to a little park that overlooks where the Missouri used to flow and the steamboats would dock and unload weary travelers and goods. Engineers have since changed the route of the river and made it much narrower here. This whole valley used to be where the river flowed. Our tour was some of the historical homes in Independence began at this point. Our first stop was the Woodson House. The house was originally built by Samuel H. Woodson in 1858, and was later rebuilt after a fire. His son Samuel Woodson, Jr., and his wife Jennie McCoy and their daughters Margaret and Elizabeth would visit the Woodsons there often. Jennie McCoy was the only daughter of John and Jane McCoy. 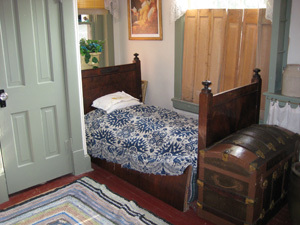 Although the house has had many owners since the Woodson’s owned it, and is currently a Bed and Breakfast, it is still identified as The Woodson House because of the important role the Woodsons played in the early days of Independence. Next Jenell Yoka gave us a tour of her wonderful home. It is the house of Lewis McCoy, who would have been the nephew of John and William McCoy. Not only was it a large, beautiful old house, but she had it furnished with wonderful antiques, including a piano and a modern stove that was designed to look like an old fashioned stove. The house was complete with the names of the McCoy children they had drawn on an attic wall, a new 4-car garage, and formal garden. It was time for lunch, and we all went to The Courthouse Exchange Restaurant, near the square. Jenell’s husband, David, joined us, and we met David Jackson, of the Jackson County Historical Society there as well. The food and atmosphere were wonderful. A description of the restaurant reads as follows: The Court House Exchange is a casual pub where locals hang out and discuss news of the day, sports, politics, and civic matters. Located below street level, the rock walls, wooden bar and fixtures lend the bar a cozy feel. Then it was on to the famous First Presbyterian Church where the McCoys, Chrismans, Swopes, Truman’s, and Wallaces all attended. It is the very church where President Harry Truman met Bess Wallace, his future wife, and where John McCoy taught bible school for 65 years. John McCoy actually used the opportunity to teach the children mathematics and Latin, as well, I found out, and this was actually where Harry Truman learned things that helped him throughout his career. The church was quite large, with huge stained-glass windows, many large high-ceilinged rooms, and beautiful woodwork, all ordered from a catalog. You’ve probably noticed that Sharon has her arm in a sling. The poor thing had been bitten by her cat, Peter, just a few days before we arrived. She picked him up at the end of a cat fight, and he bit her to the bone..ouch! After that, we headed for the famous Vail Mansion, but before arriving there, we saw more notable sites, including alleys that were the actual roads the covered wagons took on their journeys out west. Following are photos of William Chrisman High School, named after my great great great grandfather, McCoy Park, the first court house, which still stands with the originals logs it was built with, and the railroad station that was used by the early settlers. 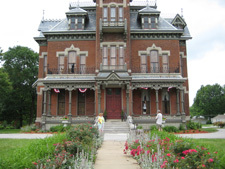 On to our personal tour of the Vaile Mansion by Jenell Yoka, who volunteers there as a tour guide. The 30-room mansion built by frontier business tycoon Harvey Vaile in 1881 had opulent conveniences like a flushing toilet and brass bathtub. He and his wife did not have children, so it was just occupied by the 2 of them and their servants. Later it was used as a sanitarium for the elderly, where Maggie Chrisman Swope actually lived until her death. It had huge rooms, etc., but the neatest thing was a small room lined with wood where the grain in the wood had been modified to create hundreds of small strange faces. Very unusual, to say the least. Here we are in front of the mansion. After a brief rest at our hotel, our final stop for the day was a dinner at the William McCoy house, currently owned by Brian and Sharon Snyder. Before we go there, however, I’ll fill you in on what happened to John McCoy’s house (my great great grandfather). John McCoy was a very successful merchant. He owned a store and wool mill, and sold yarn up and down the Missouri River. He also obtained the first contract with the U.S. government to carry mail across the plains, according to records at Miami University. His wife, Jane, was an invalid for 45 years. Once when she went home to Chillicothe for a rest, he tore down their house and built a new one that was wheelchair accessible, which was very rare at the time. The house was later torn down by Urban Renewal in the 1970’s. I have a photo of it in my scrapbook. As we approached the home of John’s brother, William McCoy, I was so pleased that it had not only survived through the years, but that caring people, like the Snyders, had purchased it and were dedicated to restoring it. Not only did the Snyders have the vision and passion to restore and preserve it, but Brian Snyder was actually a structural engineer, enabling him to do some of the work himself. The house could not have been in better hands. The house was built in 1830 by Samuel Owens, where he lived until his death in 1847. Mr. McCoy received the free title in 1851, and moved in with his bride in 1853, where they lived until his death in 1900. The property is listed on the National Register of Historic Places and is a Santa Fe National Historic Trail Site. Architecturally, the house is an example of the Side Hall Plan with characteristics of the Greek Revival and Italianate styles. In recent years, the house was separated into apartments at one time, and was filmed for an episode of “If Walls Could Talk” since the Snyders have owned it. The most interesting event that took place in the house, however, was during the Civil War when John’s family actually moved in with his brother’s family for their own safety. Union soldiers actually burned down most of the town in an effort to eliminate southern sympathizers. On the morning of August 11th in 1862, the house suddenly filled with Union soldiers as they fought Confederate soldiers to the south. Window glass was breaking and bullets were flying, and you can still see spots on the bricks outside where bullet holes were patched over. Notice the freshly painted trim, the manicured lawn, which includes numerous rose bushes, and if you look carefully to the left of me, you can even see famous Peter the cat. Inside Sharon and Brian gave us the big tour beginning with the entrance room where William McCoy is said to have spent most of his time. I’m not sure if it was the period décor of if I’m psychic, but I felt a presence when I entered the room, and Sharon said many others have said the same thing. When I walked into the living room, I smelled a wonderful blast of flowers. Sharon later informed me that the house sat on 14 acres, and 3 of the acres were just for growing flowers. She has letters documenting the numerous flowers that were always in the house, and said she occasionally smells them when there aren’t any flowers in the room. I felt certain I was being greeted by the spirits of the McCoys, as they surely had flowers in the house when company arrived. 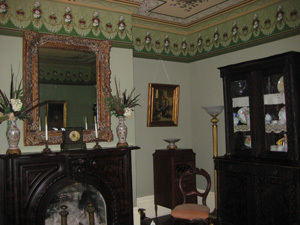 You can also see in this photo of the living room that the ceilings of these homes were often painted with flowers. They Snyders are going to great lengths to have the original ceiling paintings restored. You can see the beautiful stone fireplace and mantel as well. These are also typical of the historic homes in Independence. The Snyders also have displayed many items they have found on the property throughout the years, these include bullets and buttons, and some ceramic drainage pipes. You see, not only did the McCoys grow their own flowers on the property, but they also had their own kiln that they used to make ceramic items from the clay-like earth on their land. Upstairs, the house held more unexpected treasures. 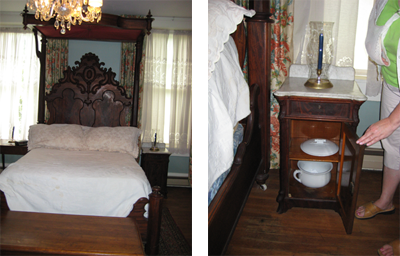 The following photos show a children’s bed, the actual bed of William and Eleanor McCoy, which includes a little roof that extends from the headboard, and last, but not least, William McCoy’s potty. His potty was literally a pot stored in a cabinet that he would use, and a servant would then empty. The cabinet is lined with a nice smelling oil to help with the odor, and believe it or not, you can still smell the oil, and yes, I smelled William McCoy’s potty (and it smelled good). Finally, we ended the evening with a wonderful dinner in the charming dining room where my ancestors surely spent many evenings sharing meals together. Jenell and David Yoka joined us, as well as friend Lee Williams, and David Jackson, the Director of Archives & Education of the Jackson County Historical Society. The gourmet dinner was prepared by Jenell and David’s son, professional chef and former neighbor, Daniel Yoka. We told stories and laughed until I was hoarse. Greg and I then returned to the Higher Ground to rest up for another fascinating day. This entry was posted in Articles, Family in Independence on July 20, 2010 by Kathy. It was hot and humid with heat indexes over 100 degrees, when Sharon picked us up early in the morning in her nifty SUV for day two of our personal tour of Jackson County, MO. She was the sole tour guide today, driving one-handed and all. Our first stop was The Jackson County Historical Society archives on Independence Square. The JCHS is actually takes up ¼ of the courthouse building in the center of the square. The courthouse is not used as a courthouse these days, in fact, the JCHS had to do without running water at the time we visited. Proof of their dedication to preserving the past, I suppose. The courthouse building stands by itself in the middle of the square with a statue of President Truman in front of it. Inside the archives were filled with shelves full of boxes and files and more files. David Jackson was at the center of it all, the only paid employee whose dedication and passion keeps things running smoothly as the collection grows. I felt proud and secure knowing the items I had contributed were being stored safely. Then we piled back into the SUV and Sharon drove us to Fort Osage. 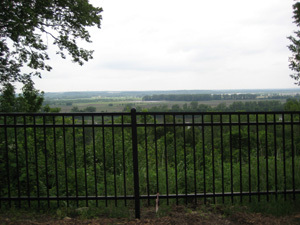 The Fort Osage National Historical Landmark in Sibley, MO, is made up of an actual fort to duplicate the fort built in 1808 using some of the original features found during excavation, and an education center building. 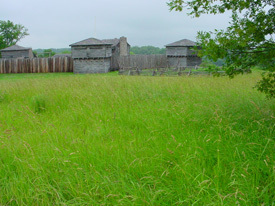 The original Fort Osage was erected under the direction of William Clark, of The Lewis and Clark expedition, and Capt. Clemson of the U.S. Army to serve several purposes. Foremost it functioned as an outpost in the newly acquired Louisiana Purchase, housing soldiers to guard the new territory and protect the U.S. Factory Trade House there. It also helped the American government befriend the area’s Osage Indians. Finally, the fort offered Missouri’s early settlers and explorers a sanctuary from which to venture westward. Walking around the buildings in the heat, it was easy to imagine the living conditions there. Sharon planned on showing us the re-enactors that normally performed, but because of budget cut-backs, there was just one re-enactor around today. His story-telling skills, however, surely made up for the lack of personnel. Inside the store, he told us the history of the fort, and on a personal note, we found out he lived in a house in Independence that was owned by one of the McCoys. The exhibit in the education building was quite interesting too. We were surprised to learn that at a time when people were generally shorter in height than they are today, the Osage Indians were well over 6 feet tall. 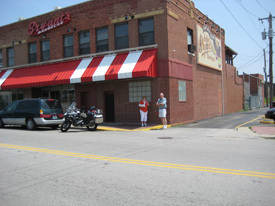 Now it was time for lunch, so we headed to downtown Kansas City, MO, for some of the best barbeque around. We ate at a crazy, loud restaurant, as famous for their barbeque and it was for their customers. We inhaled some delicious, albeit messy, sandwiches at Arthur Bryant’s Barbeque while soaking up the atmosphere as we watched everything from gun-toting agents of some kind to photos of Danny Glover on the wall. With our bellies full, we drove to Grand Ave. in Kansas City to the Arabia Steamboat Museum. Kansas City looked great to me, very clean, orderly, and well-kept. I especially liked the row of jazz clubs we passed with big colorful signs in front of them. Apparently, Kansas City has quite a jazz scene. Sharon suggested we watch the movie “Kansas City,” which we did after we got home. It takes place in many of these jazz clubs in the early 1900’s, and even has a scene filmed at a gas station in Independence that Brian Snyder later showed us. We arrived at the Arabia Steamboat Museum, and, like uncovering the sunken Arabia Steamboat itself, finding the museum was like discovering a hidden treasure. The story is a real Missouri River adventure, if there ever was one. The Arabia Steamboat was a side-wheeler steamboat which hit a tree snag in the Missouri River and sank near what is today Parkville, MO, on Sept. 5, 1856. The upper decks stayed above water so that everyone could escape, making the only casualty a mule that was tied to sawmill equipment and forgotten. Within a few days, the entire boat sank in the mud of the river, and over time the river shifted to the east, which erased any traces of what had happened. In 1987, David Hawley, a local business owner, set out to find the boat. He and his team, father Bob, brother Greg, and friends Jerry Mackey and David Luttrell, not only found the ship 45 feet under-ground, they personally raised the funds to excavate much of its contents for preservation. It turned into a life-long project for these ambitious men, which still goes on today as they continue to restore items from the wreck for display. The merchandise that has been recovered brings the year 1856 to life as you see the contents of crates of elegant china, hundreds of jars of preserved food that is still edible, hats, shoes, tools and weapons, you name it. Even the skeleton of the poor mule is laid out for display. It is an awe-inspiring collection to say the least, and it made me wonder why the exhibit wasn’t more well-known. Perhaps it was just another example of the humble spirit of the fine people of Missouri. The following photos show Greg with part of the steam engine, and Sharon and I beside the paddle wheel. 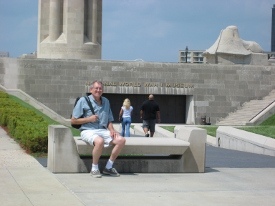 Greg was smiling from ear to ear when Sharon suggested we go to the World War I Museum next, so off we went. The Museum was designated by Congress as the United States’ official World War I Museum in 2004, opening to the public on December 2, 2006, as the National World War I Museum at Liberty Memorial. Once again, I was impressed by the fact that its presence was in large part due to the sheer tenacity of the people of Kansas City. Just two weeks after the Armistice, concerned citizens prompted Kansas City leaders to meet to discuss the need for the creation of a lasting monument to the men and women who had served and/or died in the War. R. A. Long, the founding president of the Liberty Memorial Association, said, “From its inception it was intended that this Memorial should represent on the part of all people, a living expression for all time of the gratitude of a grateful people to those who offered and who gave their lives in defense of liberty and our country.” A community-based fundraising drive in 1919, organized and led by the Liberty Memorial Association, raised over $2.5 million in just ten days. This staggering accomplishment for the time reflected the passion of public sentiment for the Great War that had dramatically changed the world. Over time the physical structure of the Liberty Memorial deteriorated, and in 1994 it was closed due to safety concerns. In 1998 the public voiced its support for the Liberty Memorial once again by passing a half-cent sales tax for 18 months to support the restoration. While revitalizing the Liberty Memorial, plans took shape for expanding the site by building a museum. The Liberty Memorial Association had been collecting objects and documents related to World War I since 1920, and the new museum was envisioned as an inspiring and engaging experience for visitors to see the collection. 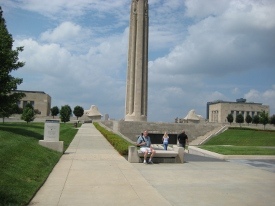 In total, the Liberty Memorial Association raised $102 million dollars for the restoration and expansion. Supporters included the City of Kansas City, the State of Missouri, the United Sates Federal Government, and generous individual donors. I was especially impressed with the modern design of the museum, which had the entrance going under ground. Once inside, there was a huge glass floor where you walked about 10 feet above 9,000 poppies on the floor below. Each poppy represented 1000 combatant deaths during WWI. At the end of the day, I couldn’t help but be amazed at the accomplishments and humility of the people of this area, far from the fanfare of the east coast and large cities. Everyone from Sharon, tirelessly showing us around and explaining the city’s history, to David, selflessly working to preserve the past at the historical society, to the lone storyteller in the heat at Ft. Osage, committed to bringing the harsh life of early settlers to life, to the hard-workers dishing out top-notch barbeque in Kansas City, to the salvage team of the Arabia Steamboat, raising the artifacts and the funds to do so by themselves, to the tremendous effort and compassion it took to assemble the WWI memorial, museum and collection inside it, to the courage, vision, and enormous heart of Col. Thomas Swope. All stories of dedication, passion and accomplishment without seeking praise or reward. I could only hope some of these characteristics would rub off on me. How interesting, I thought, that our next day would center around the actions taken by Dr. Hyde in 1909, whose character was in sharp contrast to those I had experienced today. After having dinner at a German restaurant with Brian and Sharon in Independence, we returned to The Higher Ground for the night. It was raining hard when we ventured out on the morning of June 12, 2010, having just enough time to shop for souvenirs at Independence Square before attending the book signing of Giles Fowler, author of “Deaths on Pleasant Street.” We actually didn’t have much luck finding traditional souvenirs, which was probably a tribute to the fact that Independence and its history are not yet commercialized. We were, therefore, the first to arrive at the store, ‘Wild About Harry,” which was great because I had plenty of time to talk to Mr. Fowler alone. In fact, during our visit, the electricity even went out for a while, making it feel all the more like a personal visit. The store was classy and homey at the same time, having been designed to be a tribute to Harry Truman, it catered to “things men like,” like books, office things, civil war relics, etc. Mr. Fowler was quite charming, advising us in a serious tone of some errors he recently became aware in his book, and how he going to have a corrected 2nd edition out soon. I enthusiastically bought five books, which he graciously signed. With time to kill before we needed to get ready to attend the trial re-enactment at 2:00, we headed out to see a few more sights. The first place we went to was the site where the Swope mansion had been, and, of course, the murders took place. As I stood there, I imagined everything that happened on those cold nights, from the nurses and doctors rushing in and out of the huge gothic mansion to Dr. Hyde smashing the cyanide capsule on the snow-covered sidewalk down the street. After that, we took a peek at the Truman house, and then on to lunch at Clinton’s Soda Fountain. Clinton’s Soda Fountain was the only place we went that truly seemed designed for tourists. 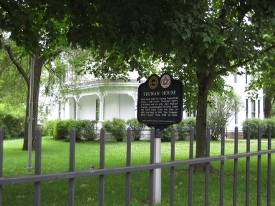 Its claim to fame is being where Harry Truman worked as a boy. He actually worked there at a soda fountain business, although it was not the current business. We had to wait through a long line of tourists, but finally had lunch at the counter and even purchased our long-desired tacky souvenir tee-shirts, etc. What I find most interesting about the place though is a story the Snyders told us about a poor woman who worked there during the time when hospitals were segregated. The poor thing ended up having to deliver her baby in a back room since she couldn’t make it to the correct hospital in time. They even said she ended up naming her baby “Clinton” in honor of his birthplace. We headed back to the hotel, at this point, to change clothes in preparation for the “Trial of the Century,” the re-enactment of the Swope-Hyde murder trial, taking place at the Truman Memorial Building. The building was within walking distance, so we scurried there and met Sharon and Brian for the big show. The place was packed with over 400 people, anxious to experience this famous trial. We weren’t the only ones who traveled a far distance to attend the show either. One pair of ladies came all the way from Texas. The auditorium was more of a school stage set-up, with the stage being along side a gymnasium floor, with permanent chairs on the upper level only. Wanting to get a good view of the show, we sat close in metal folding chairs in front of the cold air-conditioning fan. As uncomfortable as it was, I still felt privileged to see this special performance. The characters in the play were all dressed in clothes of the period, and they were actual judges and lawyers in real life. 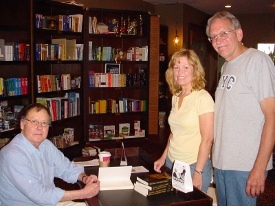 Lawyer and author Ralph Monaco, II, played Col. Thomas Swope, who narrated the story from beyond the grave. 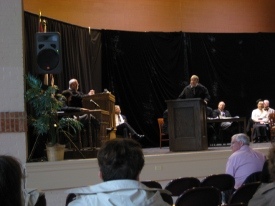 This was a wonderful way to fill the audience in on the story that lead up to the trial. The witnesses and lawyers stated their cases and really drew you into the story. We found out later that they didn’t even have lines to memorize. The actors knew the story so well, they just made it up as they went. This technique helped I’m sure, when they had microphone trouble and had to improvise even more. The trial they portrayed was the first trial in 1910. There were actually several more trials that are still studied in many law schools today, as Maggie Swope tried again and again to convict Dr. Hyde of the deaths of her brother-in-law, his cousin, and her son, and trying to murder about 5 other members of the family (including herself) with poison. After reading the facts of the case, it’s pretty obvious that he committed the crimes, but the primitive technology of the times and skills of the defense lawyers kept Dr. Hyde from being convicted. To read the entire story of the Swope murders, you can order Giles Fowler’s book, “Deaths on Pleasant Street,” and Ralph Monaco’s book, “The Strange Story of Col. Swope and Dr. Hyde,” from the Jackson County Historical Society’s website. You will find both of them listed among other books about Independence. The fun of the trial re-enactment may have been over, but the party had just begun as we walked a few blocks to attend a private party at Ophelia’s Restaurant and Inn. The elegant Ophelia’s, like many other things I found there, was more than just a beautiful place of business on Independence Square, it was a labor of love by Ken and Cindy McClain who opened it in an effort to revive the square. The party at Ophelia’s was the perfect way to celebrate the end of our wonderful trip. We had such fun talking to the cast members, who were still in custome, meeting more interesting members of the community, helping ourselves to wine and sandwiches, and spending more time with our new friends, the Snyders, Giles Fowler, David Jackson, and others. I was so thankful to the Jackson County Historical Society and the City of Independence Parks and Recreation for sponsoring these wonderful events. The fun continued as we walked to Sharon and Brian’s house to chat for the remainder of the evening, and met up with some very interesting neighbors. The first thing that caught my eye was the sign that identified The Minor House. 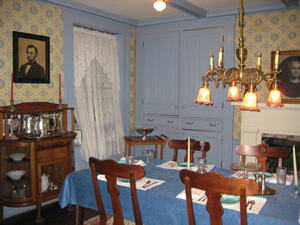 The Minor house was the home of William McCoy’s daughter Nancy McCoy Minor and husband Charles Minor. They raised daughters Eleanor and Grace in the home where the daughters continued to live for eighty years. It’s interesting to note that both parents were deaf, and since the daughters were not deaf, they actually spent a lot of time with grandparents William and Eleanor McCoy. Daughters Grace and Eleanor never married and were members of Mrs. Bess Wallace Truman’s Tuesday Bridge Club. They were also guests of President Truman in Washington during his presidency. After Eleanor passed away, Grace moved out and sold the house to a descendant of Samuel Weston, who originally built the house. The new owner restored the property and it is now divided into apartments. As if like magic, as we passed The Minor House, the neighbors in the next two houses ran out to greet us with stories to tell. The owners of the big spooky looking house next door had stories of ghosts and unexplained occurrences, and the owners of the next house down had actually been victims of Katrina and had recently relocated to Independence. What a neighborhood! We chatted with the Snyders during our final visit to the McCoy house before heading home the next morning. I can truly say that I will always hold this trip close to my heart. I made new friends, heard about old foes, and discovered family rich in history. I feel so fortunate now, and appreciate the wonderful legacy left to me in Independence, a special place that now feels like home. The following photos show the generations as they connect me to my great great grandfather in Independence beginning with John and Jane McCoy in their Independence home on their 50th wedding anniversary. Next you see their son, Joseph Addison McCoy with his son, Joseph Chrisman McCoy. 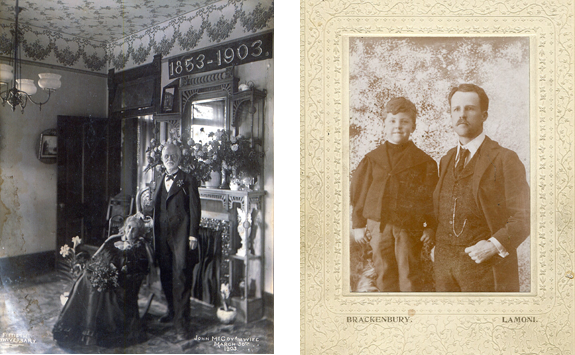 The following photo is of Joseph Chrisman McCoy as an adult with this son, Joseph Chrisman McCoy, Jr. Finally, you see Joseph Chrisman McCoy, Jr., as an adult in the 1970’s with daughters, Kathleen Ann McCoy (myself, in the middle) and Amy Elizabeth McCoy. 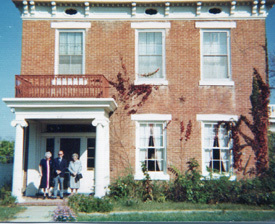 The final group of photos show Joseph Chrisman McCoy, Jr., and wife Kathleen Barbeau McCoy (my parents) on their visit to Independence in 1970’s. 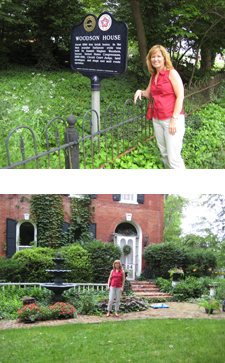 The first photo is in front of the Minor house with Grace Minor and Margaret Woodson. 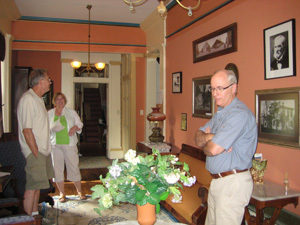 Then it is Joe McCoy and Grace Minor inside the Minor house. Final photo is Joe and ladies in front of the William McCoy house. 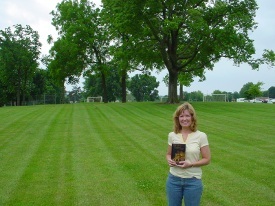 This entry was posted in Articles, Family in Independence on July 18, 2010 by Kathy.